Property search engine Rightmove launched its iPhone app today, allowing users to search for properties by location or by using the phone’s GPS. from iPhone users, so releasing an app that provides the best possible experience for these users makes sense. I compared the Rightmove and Globrix mobile websites last week, and found the iPhone optimised Globrix version the easier to use. I’ve been trying out the new app to see how it compares to the mobile site. The main screen provides the option to search by location, postcode, etc then to select buy or rent, while users can also choose to search for properties near their current location. Users can also access recent searches, saved searches, and any properties they have looked at previously and bookmarked. If you scroll down the property page, further options are nice and clear. You can call the estate agent straight away, or fill in a brief form to request details of the property, or just save it to view later. This is a very useful iPhone app, and represents a massive improvement over the old mobile version. It has more visual appeal, is quicker to load up and easier to use. I’d like to have seen more use of the maps and GPS to provide information and directions, but it is otherwise difficult to find too much to criticise about the app. With so many phones on the market, and different options for price plans, purchasing a mobile online can be a daunting prospect for customers. This is where a good selector tool can be useful. It can assist customers to find a mobile and tariff that matches their needs, and can lead to increased customer confidence and more sales. 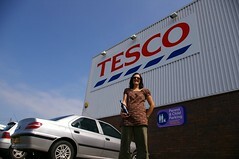 A move by Tesco may provide some hints about the state of affiliate marketing and its future. Earlier this month, Tesco sent the 150 developers who have been working with Tesco.com’s Grocery API an email detailing that the company was opening up its database to them and giving them the ability to build applications that could potentially generate lifelong affiliate commissions.